Recently, I posted a recipe for Baked Falafel. I suggested that it be served with tzatziki. 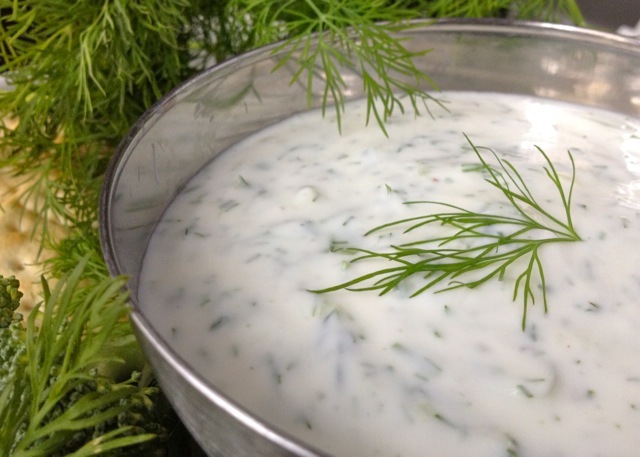 Tzatziki is a yogurt based sauce with a wonderfully fresh flavor from the dill and lemon juice. There is garlic in the sauce that adds the slightest amount of heat. And cucumber offers its coolness and adds texture to the sauce. Ned loves tzatziki. I make this tzatziki as often as 3-4 times a week, so we always have some on hand in the fridge. He puts it on everything from burritos to pizza. It’s his favorite condiment. I call it Easy Tzatziki because it’s a snap to make. From start to finish it could be made in less than 10 minutes. Tzatziki can be served along with vegetables or pita chips, or as Ned would suggest, with everything else. Place the yogurt, garlic, lemon juice, dill, salt and pepper into a medium-sized mixing bowl. Stir the mixture and set it aside. Then, slice the cucumber in half lengthwise and remove and discard the seeds with a spoon. Using the course shredding side of a box grater shred the cucumber into a bowl. Then, using a cheese cloth squeeze as much of the liquid out of the shredded cucumber and add it to the yogurt mixture. Alternatively, you can squeeze the liquid from the grated cucumber with clean hands, which is a method of often employ. Discard the cucumber juice. Stir to combine ingredients, check for seasonings. For best taste wrap and refrigerate for at least 30 minutes to allow the flavors to marry. Serve cold.